Easter provides a major opportunity for sales of red meat, and strong performance in this period can really set the scene for proteins for the remainder of the year. With many shoppers lost last year, this article touches upon their return, as well as which categories benefited most from this. After looking into the winners and losers this year, as well as how promotions were utilised, it concludes with some thoughts for what Easter 2019 might look like. 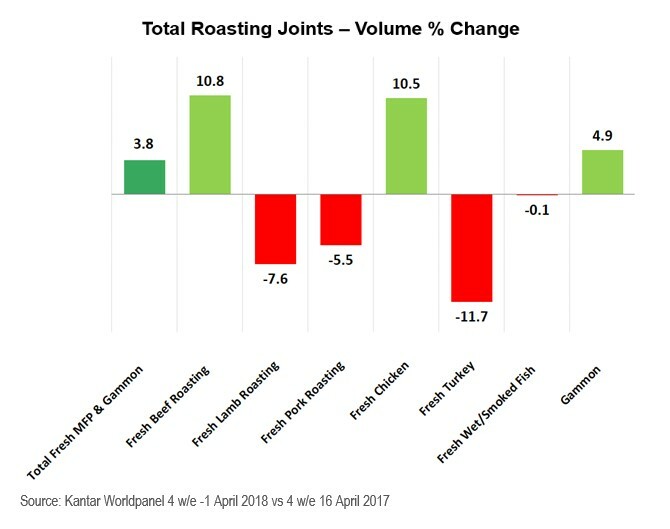 Following a difficult Easter period last year, roasting categories bounced back with both volume and value rising 3.8 per cent and 5 per cent, respectively. With Easter being three weeks earlier than last year and the weather being colder, we saw a return to a traditional Easter weekend as barbecues were not as much of a threat. As a result, we saw much higher engagement in the Easter categories, such as Easter eggs, hot cross buns, and lamb roasting joints. So, while last year, we saw shoppers dropping roasting joints from their Easter weekend (potentially due to the warm weather and subsequent appeal of the first barbecue opportunity of the year), this year we saw 488,000 shoppers adding roasting joints back to their baskets. This recruitment was driven through beef and lamb roasting joints, with the latter contributing a total of 272,000 new shoppers, spread fairly evenly across both shoulder and leg roasting joints. 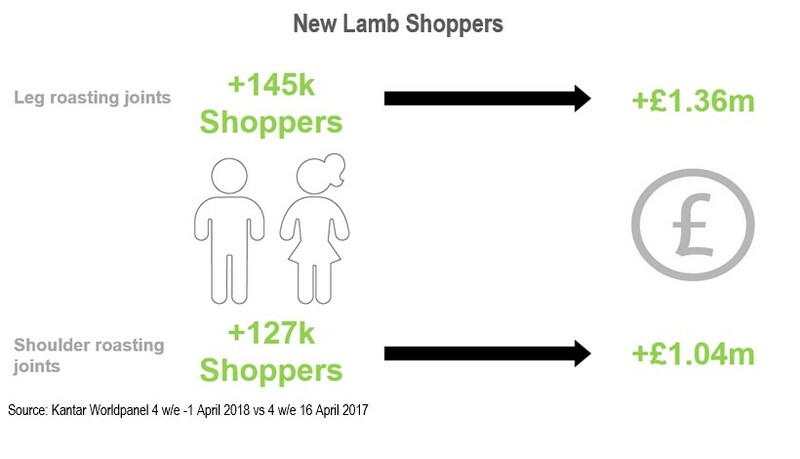 It was also interesting to see an increase in the importance of younger, single household shoppers entering the lamb roasting market this Easter. The nation’s love for chicken continued, but lamb shoulder was the big winner! 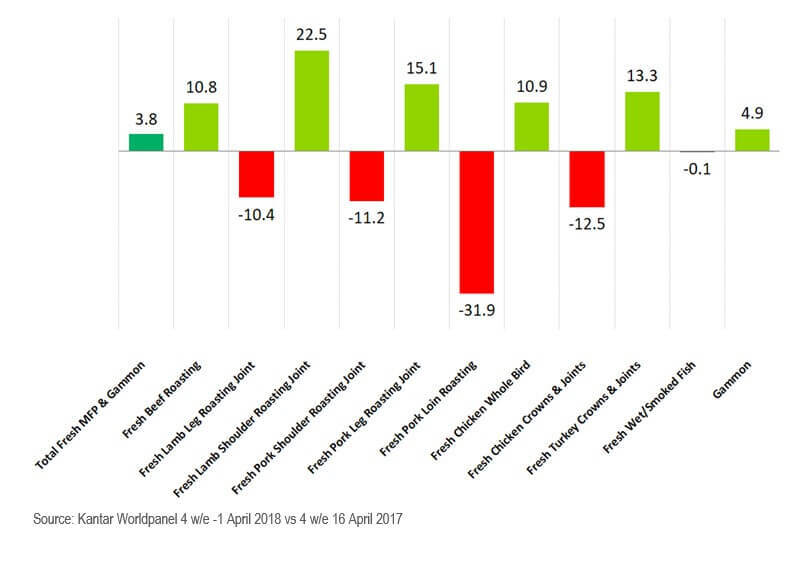 Fresh chicken whole birds contributed most of the MFP Easter volume growth, through shopper recruitment and focus on EDLP (particularly on the less prominent premium tier, something no other protein was able to do). However, it was lamb shoulder roasting joints that registered the strongest growth, with the amount purchased up 22.5 per cent compared with last Easter - so the reason why lamb didn’t perform better was because lamb leg roasting joints declined 10 per cent, dragging the total volume down by 8 per cent. In terms of spend, higher prices meant that lamb was the second best performing protein behind fresh beef roasting joints. How can we maximise promotions? We saw that, for lamb, fewer promotions caused volume decline within leg roasting joints, and vice versa for shoulder roasting joints. Those retailers who performed well within lamb were the ones who promoted regularly with shallower price cuts. The implication was that shoppers seemed to care more about visibility of promotions than how deep they are. In terms of promotion mechanics, Y for £X was the most prominent, helping to drive basket sizes. Getting premium and promotions right can unlock shopper spend. Premium works at Christmas and can work at Easter with clever promotions, merchandising and above-the-line focus. Is this something that retailers want in 2019? Promotions are vital, but do not always have to be deep-cut promotions - in-store activity helps, and Y for £X has proven to increase the baskets and, therefore, the overall volume. Will a later Easter allow us to have stronger promotions and activation in store or will other areas win off-shelf?